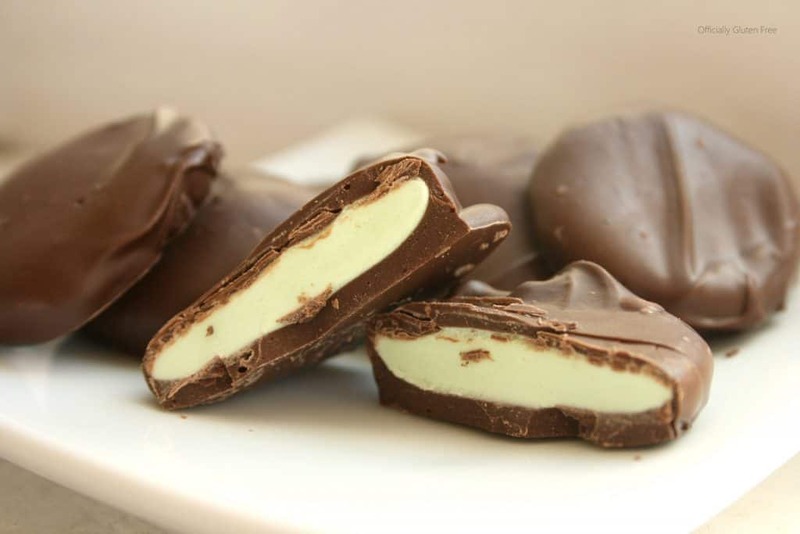 You’ll Love how Easy these Chewy Gluten Free Marshmallow Peppermint Patties are to Make. You just Melt the Marshmallows as you would if you were making Rice Krispy Squares. Stir in the Powdered Sugar, Mint Extract and the Food Colouring. Then make little balls, squish them into a disk shape and dunk them into the melted Chocolate Coating. I used a pre made Chocolate Coating but you can easily make your own by adding a 2 Tbsps of Shortening or Coconut Oil to the 3 Cups of regular melted Chocolate. This will help the Chocolate harden and not melt in your hand as quickly. My favourite part of these Marshmallow Peppermint Patties is the Soft Minty Marshmallow Centre. It almost tastes like Nougat. Which is my all time favourite candy. 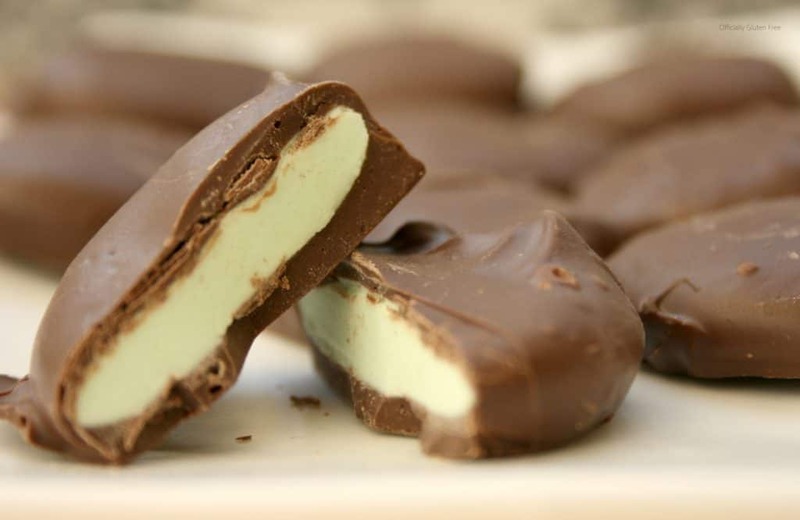 If you’re not a fan of mint or you just want to try something a little different, then try switching the mint extract for Rootbeer, Banana, Strawberry or any other flavor you can think of. 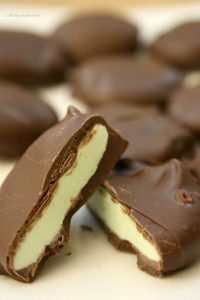 These Chocolates are perfect for Special Occasions like Valentine’s Day or Easter but also make great treats for children’s parties. If you need another easy Gluten Free recipe for Children’s Parties or Just for Brightening someone’s day then you might like this Recipe for Cinnamon Sugar Rainbow Tortilla Unicorn Chips With Rainbow Unicorn Dip. It’s The cutest thing you’re ever seen and could be easier to make. 3. Add the mint extract and food coloring and stir well. 4. Remove from heat and stir in 1/2 of a cup of the Powdered sugar. Quickly stir until combined then scrape onto 1/2 cup powdered sugar spread onto the counter. 5. Knead the mixture, mixing in the last 1/2 cup of powdered sugar, for 5 – 10 minutes or until it is smooth and no longer sticky. 6. Melt the chocolate in a double broiler. 7. Cut the minty marshmallow mixture into 1 inch pieces. Then roll into balls and flatten with your fingers. 8. Using 2 forks dip the discs into the chocolate, making sure to completely cover them. Scrape off the extra chocolate from the bottom and transfer on to a parchment paper lined baking sheet. Then put them into the refrigerator for 15 – 20 minutes. Add the mint extract and food coloring and stir well. Remove from heat and stir in ½ of a cup of the icing sugar. Quickly stir until combined then scrape onto ½ cup icing sugar spread onto the counter. Knead the mixture, mixing in the last 1/2 cup of icing sugar, for 5 - 10 minutes or until it is smooth and no longer sticky. Cut the minty marshmallow mixture into 1 inch pieces. Then roll into balls and flatten with your fingers. Using 2 forks dip the discs into the chocolate, making sure to completely cover them. 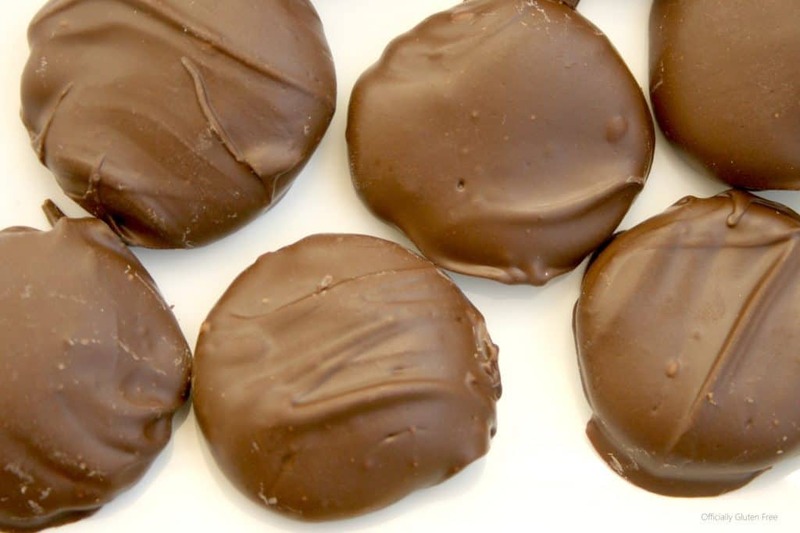 Scrape off the extra chocolate from the bottom and transfer on to a parchment paper lined baking sheet. Then put them into the refrigerator for 15 - 20 minutes. Oh these look soo good!! Would love to bite into that! Reblogged this on Officially Gluten Free.